조선시대 만들어진 종으로, 1985년까지 서울 종로 보신각에서 제야(除夜)의 종을 칠 때 사용되었다. 조선 세조 14년(1468) 만들어 신덕왕후정릉 안에 있는 정릉사에 있었으나, 그 절이 없어지면서 원각사로 옮겨졌고 임진왜란 이후 종루에 보관했다. 고종 32년(1895) 종루에 보신각이라는 현판을 걸게 되면서 보신각종이라고 불렀다. 현재는 국립중앙박물관 경내에서 보관 중이다. 총 높이 3.18m, 입 지름 2.28m, 무게 19.66톤의 큰 종이며, 전형적인 조선 초기의 종 형태를 하고 있다. 음통이 없고 2마리 용이 종의 고리 역할을 하고 있다. 어깨부분에서 중간까지 완만한 곡선을 이루다가 중간 지점부터 입구 부분까지 직선으로 되어 있다. 몸통에는 3줄의 굵은 띠를, 종 입구 위로는 일정한 간격으로 2줄의 띠를 두르고 있고, 종의 연대를 알 수 있는 긴 문장의 글이 있다. 특히 종신 몸체 상면에는 보살입상이 새겨졌던 흔적을 볼 수 있어 사찰의 종을 옮긴 후 인위적으로 이 부분을 삭제했던 것으로 추정된다. 이 종은 2번의 화재를 겪으면서 원형에 손상을 입고, 음향도 다소 변했으나 명문(銘文)이 남아있어 주조 연대를 확실히 알 수 있는 귀중한 조선시대 왕실 발원 종의 자료이다. 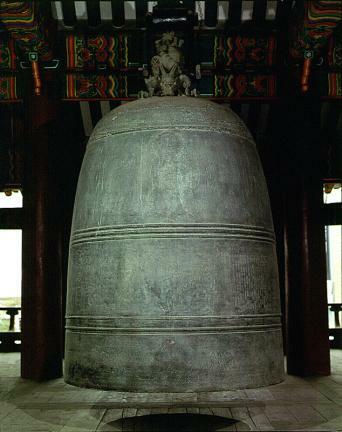 This bronze bell, cast in 1468 (the 14th year of the reign of King Sejo of the Joseon Dynasty), was used to ring out the old year on New Year's Eve at Bosingak Pavilion in Seoul until 1985. It used to be located at Jeongneungsa Temple near Jeongneung Royal Tomb (Tomb of Queen Sindeok, 1356-1398), but was moved to Wongaksa Temple, and then to a bell tower after the Japanese Invasion of Korea in 1592. Since 1895 (the 32nd year of the reign of King Gojong), when a signboard bearing the name ‘Bosingak Pavilion’ was put up in front of the bell tower, the bell has been called the 'Bosingak Bronze Bell'. 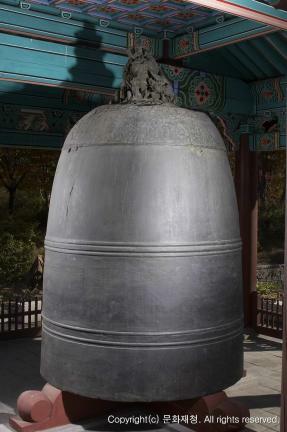 The bell is now kept in the grounds of the National Museum of Korea. This bell, which is 3.18m in height and 2.28 m in diameter and weighs 19.66 tons, exhibits the typical style of the early Joseon Dynasty. The top of the bell lacks the characteristic metal tube that helps it to emit sound when struck, but is fitted with two sculpted dragons that function as a hook with which to suspend the bell. This bell forms a graceful flowing curve from the shoulder, and a straight line from the middle to the base, with three bands around the trunk and two bands around the base, and bears a long inscription stating its origin. This bell is considered one of the most valuable heritages whose actual date of production is known, despite having been slightly damaged - in terms of its shape and sound quality - by two fires.